Logwood produces violets, greys and blacks. It is an easy and affordable dye to use and you only need a small amount to get a good colour. Logwood is not very light fast, but if the dyed item is not kept in direct sunlight, this should not be a problem. Logwood is sensitive to pH, and it tends to change from violet to brown when the dye bath is acidic. Adding a little soda ash raises the pH (making it less acidic), whilst adding lemon juice or citric acid lowers the pH making it more acidic. d) Greys and blacks on cotton with logwood. You will find information on dyeing with logwood extract here. Important: When dyeing wool with logwood chips it may help to mordant the wool using 22 grams of alum per 100 grams of wool instead of the usual 8 grams of alum per 100 grams of wool. * Note: The reason I recommend using a plastic sieve rather than a metal one is because logwood reacts quickly with any rust that may be present in a metal sieve. Put the logwood chips in a saucepan, cover with boiling water and leave overnight. The following day, boil the chips in the water for two or three hours and leave at least overnight, if possible longer. Add 100 grams of wool mordanted with alum to the dye bath and simmer for an hour. Take the wool out and add another 50 grams of wool for paler colours. You might still get some colour on a further 50 grams of wool. 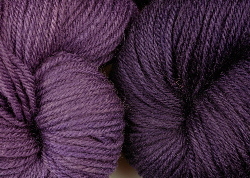 For greys with logwood, mordant your wool with 22g of alum per 100g of wool, dye it pale violet with logwood and then follow the instructions for using iron as a modifier. Depending on the quantities used, you may get a blue rather than a grey. I don’t recommended trying to get blacks on wool with logwood and iron, as a large amount of iron damages the wool. To dye wool black, it is better to dye it dark blue with indigo and then overdye it with madder and fustic. You could also try to dye a grey wool (e.g. Grey Shetland wool) with logwood to get black wool, or use wool from black sheep. First you need to mordant your cotton either with the advanced method using aluminium acetate and tannin. or mordant with the 3-step alum & tannin process. For greys with logwood, dye your mordanted cotton pale violet with logwood and then follow the instructions for using iron as a modifier. For blacks on cotton, dye your mordanted cotton dark violet with logwood and then follow the instructions for using iron as a modifier, but instead of a pinch of iron, use 15 grams of iron per 100 grams of cotton. Getting blacks on cotton is an art. You may have to repeat the dyeing and adding iron to get a black. You may also like to dye your cotton with some fustic after dyeing it with logwood to get a more interesting black. An alternative to using logwood for blacks is to dye your cotton dark blue with indigo, then overdye it with madder and fustic. Experiment with different proportions of dyes and iron, and keep a note of your results.